Adaptasun Protecticve Silky Body Mist Moderate Sun optimises cell protection and prevents photo-ageing thanks to our patented Global Cellular Protection technology. Nourishes the skin with a satin-finish. Adaptasun Protective Silky Body Mist prevents photo ageing, and protects the skin under full spectrum (UVB, UVA, visible light, infrared) but also against pollution (ozone). A multi positioning spray for a homogeneous and uniform spread. Water and sweat resistant- Alcohol free formula. A combination of noble, precious and dry-touch oils that enhances the skin. Shake well before use. 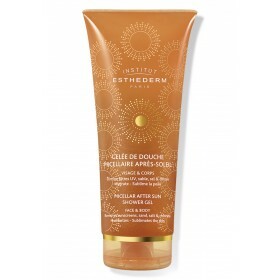 Spray 20 cm away from the body evenly and generously before sun exposure to dry or wet skin. Reapply every 2 hours and after swimming, toweling off or playing sport. A luminous, fast and long-lasting tan. Enhanced, soft and radiantly youthful skin. Ideally nourished, satin-soft and gently scented, the skin reveals its full beauty under the sun. Optimizes natural tanning, prevents photo aging, nourishes, satin-finish. conditionnement et texture très agréables mais parfum trop fort. I love this new sun care ! Definitely a must have, I love its texture and its fragrance. Very handy and easy to use, you don't even need to spread!